Bennett B Goldberg (BA'82, MS'84, PhD'87) was born in Boston, Mass. in 1959, and is a life-long Red Sox fan. He received a B.A from Harvard College in 1982, an M.S. and Ph.D. in Physics from Brown University in 1984 and 1987. 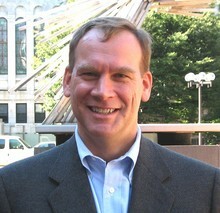 Following a Bantrell Post-doctoral appointment at the Massachusetts Institute of Technology and the Francis Bitter National Magnet Lab, he joined the physics faculty at Boston University in 1989. Goldberg is a Fellow of the American Physical Society, has been awarded a Sloan Foundation Fellowship and is a recipient of the Presidential Young Investigators Award. Goldberg is a Professor of Physics, Professor of Electrical and Computer Engineering, Professor of Biomedical Engineering, and Professor of Education. He is a former chair of the Physics Department and his active research interests are in the general area of nano-optics and spectroscopy for hard and soft materials systems. With colleagues, he has studied graphene and other 2D crystals, exploring strain and friction. He has worked in near-field imaging, developed subsurface solid immersion microscopy for Si inspection, and imaging through strongly scattering media. His group is working on novel approaches to subcellular imaging, biosensors and single virus imaging. Goldberg was the founder and Director of Boston University's Center for Nanoscience and Nanobiotechnology from 2004-14, an interdisciplinary center that brings together academic and industrial scientists and engineers in the development of nanotechnology with applications in materials and biomedicine. He continues as director of BU’s nanomedicine program, bringing engineers and physical scientists together with medical researchers and clinicians. Goldberg is currently the inaugural Director of STEM Education Initiatives in the Office of the Provost, working with colleges, departments and faculty in course transformation toward increasing the amount of evidence-based and active-learning in STEM instruction, and in developing and implementing training in teaching and learning for STEM PhD’s and postdocs, our nations future faculty.